THE CAT/RACCOON GUARD: BLUEBIRDS LIKE THEM (AND USE THEM). RECOMMENDED BY THE VIRGINIA BLUEBIRD SOCIETY. The newest design plan is on the VBS website. My next batch of guards when I expand my trail will be the recommended “coated” hardware cloth! Also, I’ve seen Tree Swallows use this with ease. 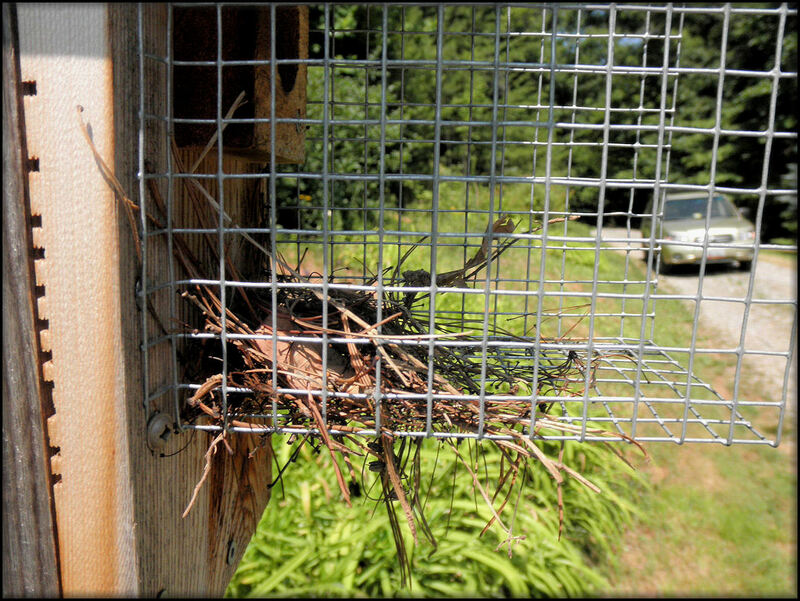 Also House Wrens and the Carolina Chickadees don’t mind them I am discovering bluebirds like to leave some of their nesting materials, either soft dried grasses or pine needles, inside this entry-hole hardware cloth guard, also known as the Noel Guard (designed by Jim Noel) just underneath the entry hole. Maybe I’m wrong, but I think this is their way of telling other birds, “AHEM! OCCUPIED” ….. and just so you know, we have this box so you may stay away!” It’s fairly consistent with bluebirds on my own trail. They like the guard to sit on and watch over their nestbox! Here is a picture of one of the boxes along my trail. You can see some of their nest material dropped in it. When I’m checking my boxes for new nests being built, this is a sure sign something good is going on inside the box! Though some people think they are not attractive; however, for me, it’s more important to enjoy the beauty of a successful fledging of baby bluebirds than finding a tragedy instead. Bluebirds like this guard. Most of the boxes on my trail show nesting materials laid on it under the entry hole. It looks like a sign to other bird species: OCCUPIED!